How North America would have looked during the last Ice Age. There’s an ongoing debate among archaeologists as to which route the first settlers of North America took to reach the continent. Some say these migrants travelled along an interior passage between two massive ice sheets, while others say they traversed along a coastal route. 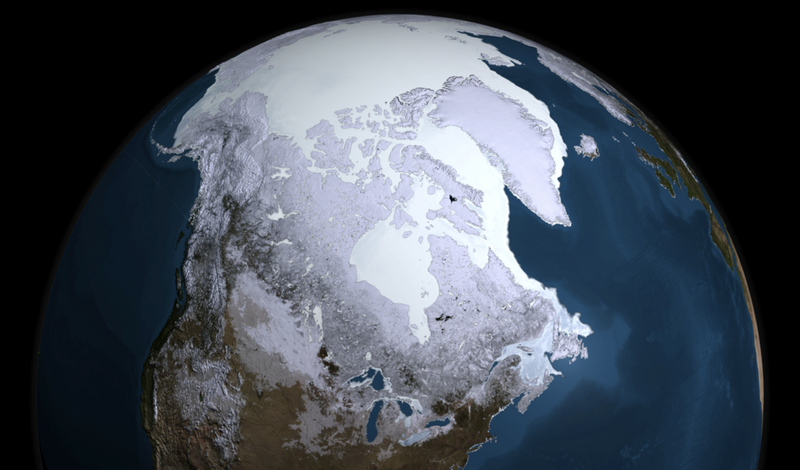 New research suggests both interpretations are correct, and that multiple pathways into North America existed by the end of the last Ice Age. Several conflicting theories currently describe the peopling of Americas, of which two are vastly more plausible than the others, according to new research published today in Science Advances. These two theories include the conventionally argued, but often maligned, Ice Free Corridor route, in which the first migrants crossed over from Beringia into the interior of Alaska, and then into the high plains of North America by venturing through two massive ice sheets around 15,500 to 13,500 years ago. The other is a newer hypothesis known as the North Pacific Coast route, also called the Kelp Highway Hypothesis, in which America’s first settlers arrived by hugging the coastline along southern Beringia and North America’s west coast, no earlier than about 17,000 years ago. Locations analyzed in the new study. To reach this conclusion, Potter’s team evaluated recent claims and discoveries made by archaeologists, anthropologists, geologists, and geneticists, concluding that both the Ice Free Corridor route and the North Pacific Coast route should be considered viable migration routes, and that both warrant further study. This evidence, according to the new study, suggests the ancestors of indigenous Americans split from East Asians around 25,000 years ago, followed by a prolonged period of genetic isolation, a theory known as the standstill model. Northwest North America with archeological sites older than 10,000 years ago. Following this phase, a population expansion occurred between 16,000 and 14,000 years ago, which corresponds to archaeological sites in the Americas. Recently, some scientists have argued against the interior route, saying it did not exist during this time period or that it wasn’t conducive to human habitability (the ice-free corridor became habitable around 12,600 years ago, several thousand years after the coastline opened up). Potter’s team disagrees, pointing to a slew of recent studies affirming the timing and presence of an ice-free corridor. “The last deglaciated part—the bottleneck—was ice-free and glacial lake free by at least 15,000 years ago,” said Potter. “So some recent studies have provided minimum dates on viability based on lake core DNA or bison DNA analyses, and these are around 12,600 to 13,100 years ago.” These are minimum dates, said Potter, and the interior corridor could have opened up even earlier. Regardless, he said the Ice Free Corridor theory is far from dead. Archaeological evidence is stronger for the interior route, but the authors say there are good reasons to believe that a coastal migration route also existed. New research published this past May, for example, showed that four islands along the Alaskan coast were free of ice around 17,000 years ago, and that these areas were capable of supporting human life (this was based on geological work and the discovery of animal bones). In March, scientists announced the discovery of 29 human footprints buried on the shoreline of Calvert Island in British Columbia dating to around 13,000 years ago (a neat find, but these prints appeared thousands of years after the coastline opened up). Indeed, archaeological evidence for the North Pacific Coast route is practically non-existent. The earliest occupations from the Aleutians to Yakutat Bay in Southeast Alaska are dated at around 8,000 years ago, which is 6,000 years after the earliest interior occupations. What’s more, these coastline-hugging humans used technologies derived from the traditions of people living in the interior. Data is lacking for the northernmost areas of the proposed coastal route, and we don’t know how lingering ice, ongoing volcanism in the region, the stability of kelp, or other factors may have made the coastal route dangerous or unfit for human occupation. Alia Lesnek, a PhD candidate in the Department of Geology at the University at Buffalo who wasn’t involved in the new study, said the new paper provides a balanced analysis of the current ideas about how humans first colonized the Americas. Christiana Scheib, from the Department of Archaeology and Anthropology at the University of Cambridge, said it’s important to point out that the new paper is a review article, and that the authors didn’t provide any new data. What’s more, she said the authors failed to cite some recent genomics papers, which could provide more information about which groups were involved in the migration(s) and the timing of these events. It’s also clear, she said, that that the data was presented in a way that promotes the inland corridor over the western coastal route. Like Lesnek, Scheib said we need more evidence to be certain.